Have you heard of the Paleo Diet yet? I am all for it. Basically the Paelo way of eating mimics diets of our hunter-gatherer ancestors. You eat lean meats, seafood, vegetables, fruits and nuts. You cut out all the processed CRAP that is in so much of our food today, which is being linked to so many heath problems. The Paleo Diet encourages you to replace dairy and grain products with fresh fruits and vegetables. I have been researching a ton of recipes and recently came across this recipe for brownies. After reading all the outstanding reviews I knew I needed to make them for my family and try them out myself. 1 cup of almond butter. You can make your own if you want to save a few bucks. 1 cup of dark chocolate chips. I used gluten free chocolate chips. 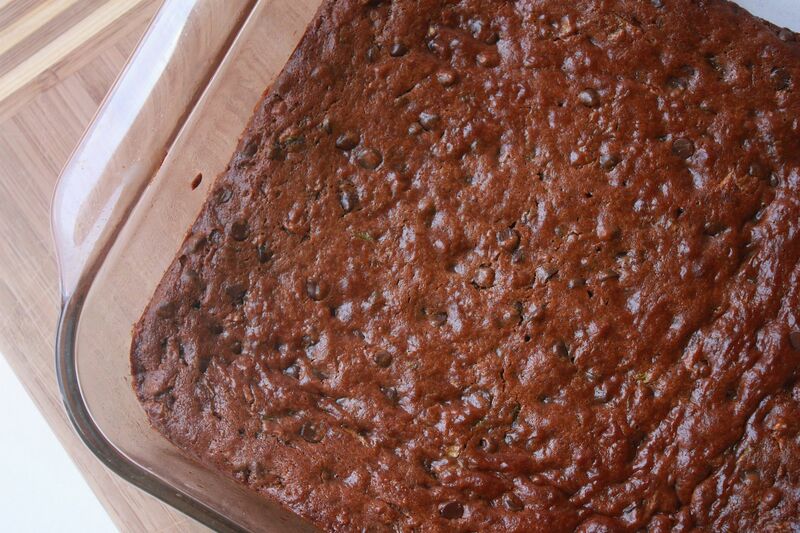 So how in the world do flourless zucchini brownies taste you may be wondering? They are the BEST brownies EVER--prepare yourself. My husband, who now thinks he is a food critic said, "The zucchini was subtle and not overpowering and they melt in your mouth." Haha I love it. He knows that I am going to put what he says into my blog (I have actually not posted recipes based on what he has said) so I think he tries to get all fancy with his critique. I will be making these again very soon. I would love to know the estimated carb-count. Typically, I wouldn't care because a brownie is a brownie, but my newfound Type 1 Diagnosis demands carb-counting rigor. Those look delicious! I've never heard of the Paleo Diet but the brownies look AH-MAZING!! One of my friends is strictly paleo and she loves it. I'll have to pass this along to her (and maybe try these out for myself). They look so yummy and moist! I've never heard of that diet - but I'm definitely looking into it! :) Thanks for sharing! they look AMAZING! I am definitely going to try this! Oh... Quick question, looks like you peeled the skin off the zucchini first... Does it make a difference? Nicole- I shredded the zucchini first and then chopped it up into really small pieces. You definitely want it to be chopped up. Ian cracks me up! Maybe next time I come up you can make a batch and I can see what creative words I can come up with for the brownies. Haha! Funny about your husband. I actually work for a school that focuses on alternative medicine and this is exactly the type of diet they encourage! Eat like our ancestors did! Ooo how interesting!! Totally want to try these! Yum! I just read The Paleo Solution book! It was great, and I think it makes a lot of sense to go back to what our ancestors did. It is so tough though! Thank you so much for sharing this recipe. It looks awesome and I will for sure be trying it! We make brownies with black beans and spinach that blow my mind! They are only good cold though and there is nothing I love more than a HOT from the oven brownie! Are these good hot?? I just planted our zucchini plants so these are pinned! Oh wow, this sounds too good to be true! I have got to try it! They look amazing! Oh wow this definitely not a recipe I would have imagined but I can totally see how it would be awesome. After all, zucchini bread is amazing and so moist! Wow these look so moist! I usually make my brownies from a box haha because I think they're better than homemade, but these look really good! I like all of the natural ingredients you used. Also, I bake with zucchini a lot and we always like it - I've just never put it in brownies! Oh my goodness Lindsay. Your husband cracks me up. My husband critics all of the fashion posts I do, which is both ridiculous and kind of funny. He thinks he's a good critic of women's clothing trends. But anyway. The brownies really do look amazing. Maybe I'll see what Matt says! Just made these today - my house smells delicious and they taste great! I just used the smallest holes on my box grater for the zucchini and it was a snap. Need to make these, they look delicious! These sound amazing! And I love what your husband said, LOL!! This is going to be my next cooking project, we are a gluten free family. WOW! making these babies for mother's day!! I found this on pinterest and they were amazing! I was wondering if you ever tried to make these with peanut butter instead of almond butter? Great recipe! Unknown and Laura- You could definitely use peanut butter instead of almond butter. So I made these today with homemade pecan butter. They are delicious! However I would really call them more of a chocolate chip zucchini cake. I kept wondering how it would really be a brownie with no chocolate in the actual cake part. I would definitely add some cocoa powder to the cake batter next time for more chocolatey-ness. Might mean adding a tad more honey or egg but would be worth it. omg, omg omg. I made these today to try and quiet my end of pregnancy sweet tooth a little bit and they did NOT disappoint! WOW! A few tweaks I did - I used mini dark chocolate chips and cut it to 3/4 cup. I added 2 TBSP unsweetened cocoa powder to the batter along with 1 dropperful of chocolate liquid stevia. I cut the honey to 1/4 cup - may even cut to 1/8 cup next time? I baked in a 8x13 pan for about 55 minutes. Ooey, gooey right out of the oven, thank you!!! these sound amazing - and i am all about skipping the flour right now! wow, can't wait to try it!! I have been leaning towards trying out the Paelo diet, but I may have to start small :) I had no idea you could make such yummy treats without using any processed ingredients...definitely giving these a try! Are you sure you didn't add cocoa powder? Lol.. Your batter looks so much darker than mine! I just made these and they're REALLY good. I'm GF so always looking for a good GF dessert recipe. Thanks! The only issue I had is that my chocolate chips sank to the bottom so all of the chocolate is... on the bottom! I notice you used tiny little chips though so maybe yours melted faster. Mine were big. Maybe I'll melt & cool them a little first? Do you think that'd change it too much? Oh, AND for those who were wondering, I left the skins on my zuchinni, just like I do when I make zuchinni bread (in my pre-GF life) & it was great! Made these yesterday and they turned out great! Even my husband was impressed (and as a processed food junky, he is hard to please). I too left the skin on the zucchini and used a grater. Also, I cut down on the honey and it still turned out great. Thinking I might add some cocoa powder next time just to see how it turns out. Thank you so much for sharing! Is there any alternative to using the honey? What about using granulated stevia or splenda? Anyone know? I also would probably use sunflower seed butter since my boyfriend has a nut allergy. Regardless, these look AMAZING! Mmmm this are going in the recipe box! I'm a total chocoholic! Love this healthy version of brownies! Thanks. I made a version of this yesterday! Do you have to use raw honey? or will regular processed honey still do the job? I just made these! They are really good! I used regular honey (bc I didn't have raw) and I did 1.5 times the whole recipe and used a 9x13 pan. It worked perfect. I was wondering if you knew the calorie count on these? And the net carb count? Would be much appreciated. THANKS SO MUCH for the recipe! In each brownie there was approx. 220 calories. Not too bad! Thanks again! Love this recipe! WOW I made these the other day and I was BLOWN AWAY by how good they are. I cut the cinnamon in half, left out the nutmeg, used agave nectar, added 2 big teaspoons of dark cocoa powder and some crushed walnuts on top. We had a little taste after dinner but just a bite and they were good, but after a night in the fridge BOY OH BOY!!! Even my husband who HATES squash could not believe me when I guinea pigged him and told him what was in them after he had a bite. Oh I forgot to say I used all natural peanut butter. wow. since I am gluten free I will try these for sure!!! thanks!!! could I somehow substitute chocolate chips with cocoa powder? I just made these yesterday, and they were very good, but mine were quite oily on the bottom, has anyone else noticed this? I used an all natural no stir almond butter, also my chips all sank to the bottom so mine were kind of like a blondie with a layer of chocolate. Still good though. I think because of the oilyness i had i thought mine tasted better cold. A great healthy recipe that i will definitely be making again and again. I made these tonight for a cookout and they turned out great!! Thanks for the recipe!!! I'm allergic on both counts! 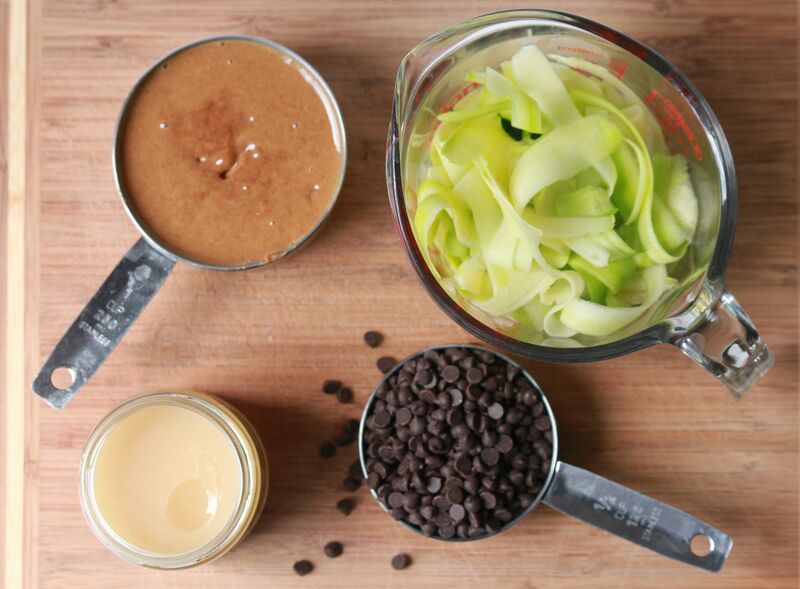 Alecia Jean- You could try using sunflower seed butter or cashew butter. This looks and sounds super-yummy, and I will definitely be giving it a try soon! I used the SparkPeople recipe calculator to estimate the nutrition data on these. Assuming you cut 16 brownies, each one has about 200 calories, 17 net carbs, 2g fiber. Can't wait to try them! These were pretty good, made the whole thing in the food processor. Like others said, my chips went to the bottom, so all the chocolate was there. If you don't need to be GF or aren't doing paleo, these aren't any healthier than traditional brownies, just slightly higher protein. Here's the breakdown. I just made these and they are yummy. They don't look anything like your picture though which is disappointing because yours look so chocolatey and delicious! Mine turned out more like chocolate chip zucchini bread bars. I'm wondering how this happened because I followed the recipe exactly! Except I used Tollhouse dark chocolate chips, which didn't melt so maybe this is part of the problem. Do you remember what brand GF dark chips you used? I also baked in a 9x13 brownie pan and they were done in about 27 minutes. Thanks for the yummy Paleo recipe! I am interested in experimenting again to achieve a more chocolatey and brownie like result! I just had to make these brownies for our upcoming road trip. I didn't have any almond butter, nor did I believe they would be chocolatey enough. So, I used natural peanut butter to which I added a 1/2 cup of dry cocoa. Also, because we are leaving on vacation soon and I'm trying to use up ingredients in the house, I used the entire bag of chocolate chips (so as to not have leftovers). I also didn't have any raw honey, so I used just regular honey. Anyway, so far so good. They are delicious! I would, however, in the future use less cinnamon and nutmeg. can I use agave nectar instead of honey? I used cacao powder and cacao nibs instead of the chocolate chips and then sprinkled the top with coconut sugar. Wow, these were good. Thanks for the recipe. Love your site!! Is there supposed to be cocoa in the ingredients for these brownies. The picture looks like some cocoa powder can be seen but I don't see it listed? I can't figure out how they would look like brownies without the cocoa??? But maybe I'm missing it? I really want to make these soon but wanted to check to see if cocoa should be used and how much? Gina- cocoa was not used in this recipe. Only ingredients used were the ones I listed. Just made these tonight! SUPER YUMMY! I have been paleo for around 4 months now and this was my first dessert. It tasted more like a gingerbread with chocolate chips, rather than brownies, but I still loved it. I just adored how moist they were. I made these last night and absolutely LOVED them!!! I am a chocolate finatic, so I was skeptical....but YUM! THANK YOU sooooo much for posting the recipe! Amazing, thanks so much. substitute for the egg? They look so moist!! I'm drooling!! I doubted you but this recipe really works. I put the zucchini and chocolate chips in the food processor together and they turned out exactly like a brownie. My kids love them and this will be our summer brownie recipe from now on! I'm amazed...completely amazed. I made these last night and oh my goodness they are delicious! I added 2 tbsp. unsweetened cocoa powder and about 4 tbsp. coffee granules (I know this is not paleo), very good. Would like to figure out how to make more chewy rather than cakey, but still fabulous. Just made these - they are AMAZING! Thanks for sharing! I found your recipe on pinterest, made them, and loved them! Thank you! Just great. Firts time I bake anything without flour. My familly was happy with the result. Only, the yfound it too sweet. Next time I should reduce the amount of honey. Thanks for it. 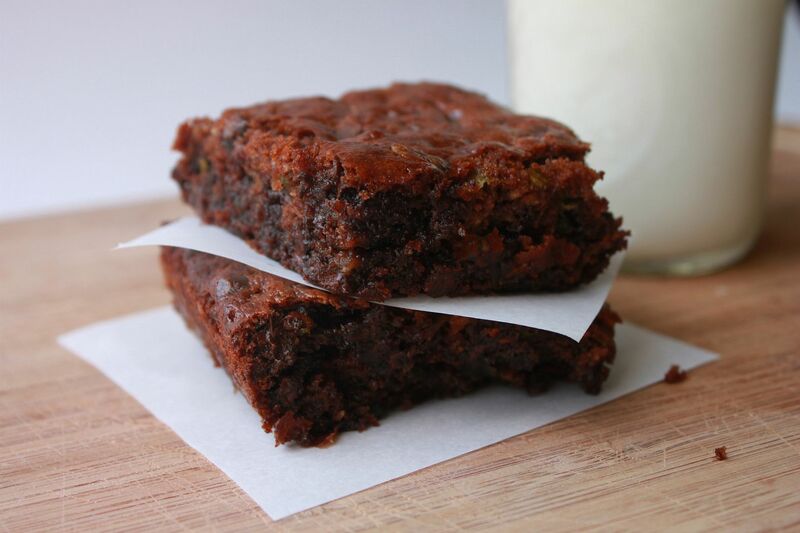 I made these once and then tried 2 other zucchini and/or black bean brownie recipes and these are BY FAR THE BEST!!! Delicious and full of good-for-you ingredients. Thanks for a great recipe! Ooooh thank god for paleo desserts!!!! Just picked up the ingredients!!! OMG! Delicious! I just made them and instead of the chocolate chips used 1/4c broken chocolate bar (all I had), and 1/2c unsweetened cocoa powder! I cannot freak out about this enough! SO MOIST! SO CHOCOLATELY! SO DE-FRIGGIN-LICIOUS! Just made these brownies last night and they were to DIE for. Everyone really liked them and they are so unbelievably moist! This recipe is certainly a keeper. Saw these on pinterest and made them last night. They're very good, but I think the comments made me expect something even better. They're chocolatey and nice to eat, but we thought they still taste very healthy, not like a regular brownie. And we don't eat any junk food and we severely limit sugar/honey consumption, so we eat a lot of healthy, less sweet treats. But these are worth making, just not as unbelievably delicious to us as they were to others! I just made these and they are fabulous! I did add about 1/4 cup of dark cocoa powder to the recipe. You picture looks like it must have cocoa powder in it, but it is not listed in the ingredients. Thanks for the wonderful recipe!! Made today and they are fantastic! I also added 1/4 cup cocoa powder. Thank you so much for this recipe! I just made this, after specifically buying (what I thought was) zucchini yesterday. As it turns out, it was cucumber. I was already halfway into the recipe, so I made them anyway. Even though the smell was still cucumber-y , they did not taste like anything but chocolate brownies. I did add a few more choc. chips just in case. My kids were totally grossed out about the whole idea of any veggies in the dessert, so I get to eat all of them with my husband, lol. I made my own almond butter from your recipe, too. Thank you! I love your blog and I really want to use some of your recipes to cook for my family. This recipe, for example, seems soo right to try. But, I'm not sure I can get "raw honey" from stores in my country. How can I replace it?? Please answer me. These are AMAZING!!! Very moist and just enough sweetness. I cut the cinnamon in half and it was still very tasty. Did anyone come up with a vegan version? Is there an egg substitute? I loved, loved, loved these brownies. I made them for my non-Paleo friends, and had to share your recipe with them. I used GF dark choc mini chips, and they were perfect..
Great recipe! I made it this past week and my family loved it. I have an egg allergy so I substitute chia seeds. 1 Tbsp chia seed + 3 Tbsp water = 1 egg (mix the chia and water in a small bowl and let it sit for about 10 minutes until it gels). I am making these for the second time, they are very yummy. I make these each week to satisfy my sweet tooth, and I bake them in a muffin tin so they're portioned out. My only tweak to the recipe is that I add fresh chocolate mint to the recipe to spice it up a bit. Thanks you, I love this recipe! Those who asked about a vegan egg substitute, I made these today using a flax egg and they turned out amazing! I added a bit of carob powder and used pb instead of almond butter, plus a bit less sweetener. SO good! Did u peel it first?? The question was asked and ur answer was to shred & chop. But did u peel it first???. I did peel them first but it would not really matter if you left the skin on. I like to mix a "regular" diet with a lot of gluten free, vegan, and paleo recipes. I like to bake with veggies and in our house brownies are the preferred dessert so i'm going to make a batch of these. So...I have been searching high and low for a Paleo brownie recipe that didn't taste horrid, and this is fantastic! Thank you! I pinned it, and plan to make it this weekend for my son when he comes home! Cooling on my stovetop as I write....already got a compliment on the smell. I've made it - http://www.madebybronwyn.blogspot.com.au/2012/09/i-make-stuff-all-time-but-not-all-of-it.html - really good. Amazing cakey texture. Maybe not as attractive as yours, but no complaints on the taste! So Tasty, My boyfriend raved! and then helped himself to thirds. Made this and they are sooooo good! I made by own almond butter using cocoa almonds! Thanks for sharing and happy eating! Thanks Lindsay! I used the cacao nibs and the recipe turned out just as delicious! Not as chocolatey, but still gooey and brownie-ish! ;) I have been going crazy making all of your recipes lately and ALL of them have turned out great. I have a number of food allergies and your recipes make me feel like I can eat "normal" food again. Thank you for your wonderful site! I'm so happy with this recipe, it is absolutely delicious. Even Fussy Husband likes it! I'm a long time lowcarber as well as Paleo, so I'll tweak it a bit more to make it more low carb, but thank you for such a fantastic idea! Thank you for this recipe. Made for my family and they were a huge hit. Thank you for a way to satisfy my brownie craving, healthfully! I did as one post said, and added a dropper of liquid stevia (I used vanilla) and 2 Tbspns. cocoa powder. Divine! They rose up high, and were so moist and perfect. My daughter, age 8, did notice the zucchini because she saw the green flecks, so peeling first is wise if you have a picky eater in the house. Bravo! More recipes like this, please! Made these for a get together last night and everyone loved them!!! So easy too!! "Yum-o. The variety of textures emphasizes the gooeyness of the chocolate chips as little pockets of bliss (sigh). And to think that something so tasty and satisfying to one’s sweet tooth contains a vegetable (or fruit but who’s being technical)! Is this brownie also good for us? Get outta town…"
Made these last night. Such a hit! What can I substitute for almond butter? I have been making these for months now. Probably at least 10 times. This is my go-to homemade sweet treat and we love them! I snicker to myself as I watch my kids gobble them up, they have no idea they are eating zucchini!! 1. Processed the zucchini in a food processor before mixing ingredients together. 2. Used crunchy almond butter (which is thicker than the more runny, creamy version - this creates a thicker texture in the finished product). 3. Melted the chocolate chips before mixing into the batter. The chocolate chips I use are really big (Ghirardheli dark) and always ended up at the bottom of the brownies, leaving the top less chocolaty and more zucchini-y. The chocolate goodness was incorporated into every bite and it was amazing! I might have (accidentally hehe) used a little more than 1 cup of the chips. Anyway, they were PERFECT! I plan on fooling people with these very soon. I wish there was always a 'print recipe' option on recipies. I don't have a laptop and I don't want to print everyone's comments with the recipies. These brownies sound beyond divine..Never seen this combo before! Can you use raw cacao powder or the cacao nibs in place of the dark chocolate chips? 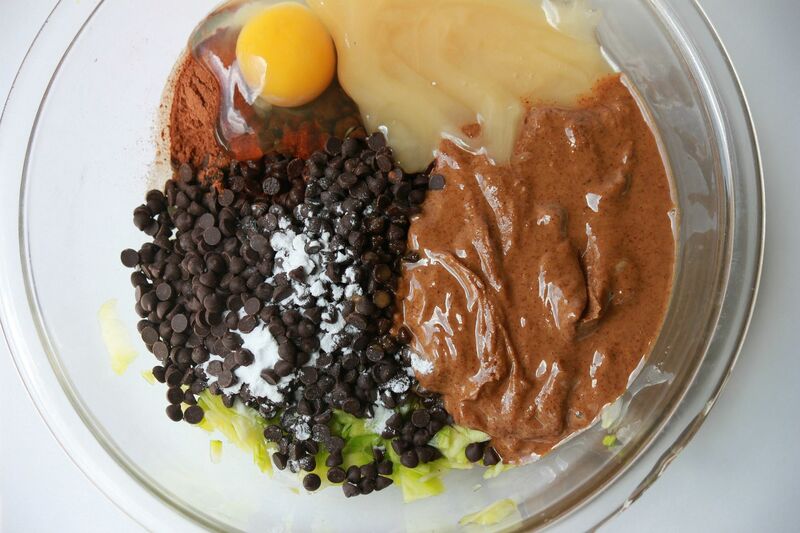 can you substitute raw cacao powder or cacao nibs in place of the dark chocolate chips? I have had these a couple times - AWESOME! I am not Paleo Diet but I cant have wheat, soy, processed sugar, cow dairy to name a few - love the brownies and the website! I have been on a quest for the perfect brownie for a couple of years now. But I wanted one that was not chock full of white sugar, white flour and ideally, gluten free. I tried them with black beans, applesauce and various gluten free flours but NONE, I repeat NONE, turned out as indescribably delicious as these. The first time I made them I didn't have a full cup of almond butter so I added 1/2 c almond butter with 1/2 c mocha cappuccino hazelnut spread and they were equally great. I think they are the best cold out of the fridge. Now that summer's here and the zucchini are multiplying like rabbits, I have been making them a couple of times a week. I am not a formally educated cook so I totally don't get how they come out so great using the nut butter instead of flour, but kudos to you momma, this deserves some sort of award!! I used peanut butter instead of almond butter and I put 1 1/2 tsp of coco powder and only used 3/4 cup of chocolate chips. I shredded the zucchini with my food processor then put everything in my food processor (even the chocolate chips) then got a 9x9 pan and lined it with wax paper (way easier to get out!) and baked it for 35mins on 350. I wish I could post a picture ! is there nutritional info on these they look amazing!! I made these exactly per the recipe, even the same type of choc chips and chopped the zucchini after shredding it (let it drain a bit first and squeezed out some of the liquid). The brownies were quite fudgy and my picky teenage daughters (and I) all loved them. Those look really good. I am definitely going to have to try these with the kids. I always love finding healthier alternatives, that still taste great. Thanks for sharing! Perfect timing for this recipe as I have an abundance of zucchini from my garden! Thank you from my family of brownie lovers. It sounds amazing! Could you use this receipe and just omit the egg or does it have to be in there? as i am on atkins diet can i add stevia instead of honey and cocoa powder instead of choc chips? My son is allergic to almonds -- i would assume substituting sunbutter is fine as it is a similar consistency but what about black bean puree? i have heard of brownies made from black beans. I made these today for desert, and they were SO GOOD! I peeled the zuchini first, then grated it. My three year old son had like three helpings. But with no sugar, juist raw honey, this is the best treat ever. All of the chocolate chips melted, I didn't see any left at the top, like in your photo. They truly tasted like brownies, soft and chocolatey. Great for kids! A great recipe find, thanks! THESE are in my oven as I type. They smell soooo gooood!!! Uh, hands down. I'm not making brownies any other way from now on. Brownies came out delicious! I substitued chocolate chips with cacao nips. I don't even feel guilty about eating this for my mid morning snack. Thank you for posting!!!! I made this today using all the same ingredients except I chopped dark chocolate bcuz couldn't find chips. My only complaint is that it was very bitter and wish it was sweeter. Any suggestions for making it sweeter? Maybe use more honey or maybe maple syrup? Anonymous- I would suggest using the chocolate chips instead of the dark chopped chocolate next time. That might have caused your brownies to taste bitter. These are truly amazing!!! My picky husband ate almost the whole pan! Thank you so much for sharing! What can you use in place of honey? I just tried this recipe & it was DELICIOUS! My first time cooking with Zucchini & it pleasantly surprisded my expectations. I will definitely chop it up much smaller next time, but the brownies are great! Thanks! For me this turned out as a fabulous chocolate cake and not a brownie but I also made some modifications. I used crunchy natural peanut butter, regular honey, melted milk chocolate chips, 2 Tbsp unsweetened cocoa powder and blended everything in a food processor. I'm not gluten free or on the paleo diet...just trying to keep up with the zucchini in our garden already this year. This will definitely be going in the recipe book for the next time I need to make chocolate cake. A friend made these and they came out great. Tried making them myself and they did not come out as dark as hers or your brownies. Did I do something wrong? These are my go-to brownie recipe. Love them and thank you so much for the wonderful recipe! I love the recipes you share in this blog. I like to collect new recipes from internet and try it. I will be trying this one very soon. When you say mix together..do you mean just use a wooden soup and mix or do you mean beat together with mixer? Would this work with a nut free butter, such as sunflower seed butter? We really enjoyed this! I've made it twice - the second time I used mini chocolate chips, and just 1/2 cup. (We've been calling it snack cake, since it doesn't really remind me of a brownie...but it's delicious!) Thanks! Can you use an egg substitute with these? These are absolutely amazing. The guys in my office love them and guys are hard to please, especially if you tell them zucchini is involved. Made this recipe tonight and the brownies came out absolutely delicious!! They are so moist and you would never think that they had zucchini and no flour in them. Taking some but not all with me to work tomorrow!! I'll will definitely make this recipe again. Thank you, they taste great!! I'm eating a low-carb paleo type diet and brownies are my fav dessert. I'm gluten intolerant so I've been looking for a good flourless recipe. I made another blog recipe before and it was gross. I made these last night, with a few small variations and they were quite tasty! More of a flan type consistency than a brownie but that could have been my mods. I puréed the zucchini, replaced the honey with agave nectar because it's lower glycemic, and used 1/4 cup of cocoa powder because I didn't have chocolate chips. And I omitted the nutmeg. I processed it all in my ninja blender and baked as you directed and it was definitely a winner! Thanks for sharing! Love this recipe. I make it all the time, people love it and it's so easy!